The latest versions of Safari for iOS allows users to easily close all browser tabs that are open, all at once, again. 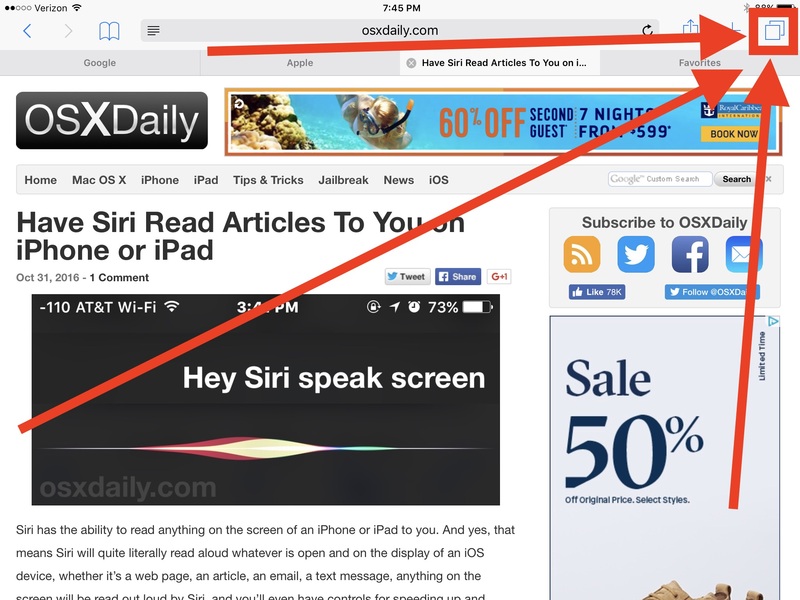 This great Safari feature makes it easier to manage and close out tons of browser tabs on the iPhone and iPad, rather than relying on closing individual tabs in Safari for iOS. 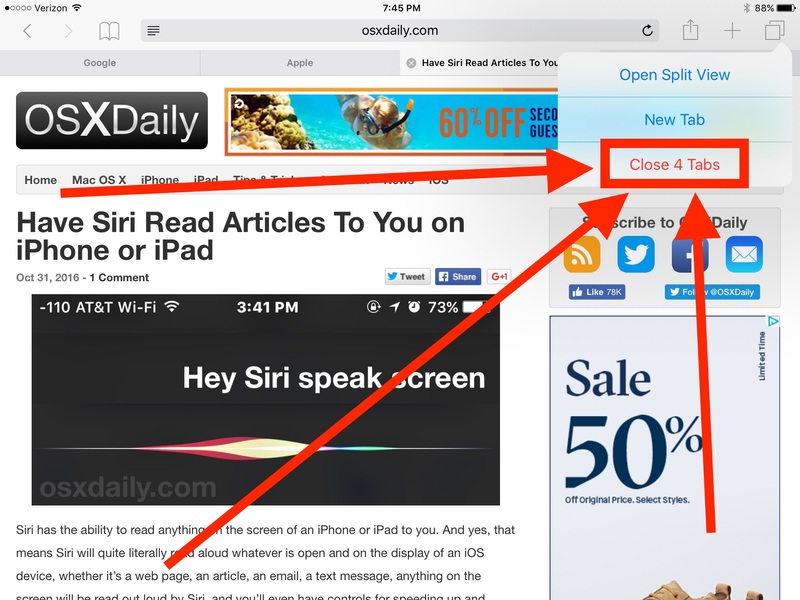 Like many other features in iOS, the ability to close all of your Safari browser tabs is a little hidden and less than obvious, but once you learn how to access the feature in Safari, you’ll quickly get the swing of things and appreciate the useful feature. Let’s cover how to use close out all browser tabs in Safari for iPhone, iPad, and iPod touch in the latest and greatest versions of iOS. The feature exists on iOS for both iPad and iPhone, though it may look slightly differently depending on the screen it’s displayed on, nonetheless the feature is always accessed by a long tap and hold on the browser tabs button. And yes this quite literally closes every single browser tab that was open in Safari, leaving you a blank slate to open new tabs as needed. This can be particularly nice if you wind up with dozens of tabs open in Safari, something which is fairly easy to happen as you browse over time. If all of this sounds familiar, you’re not experiencing de ja vu, it’s likely because this isn’t actually the first time there has been a “Close All” tab in iOS Safari. In fact, once upon a time the same great feature existed, but for unknown reasons it was removed, only to be reinstated yet again in the modern versions of iOS. Fortunatley you can easily close all your browser tabs again, for now anyway, though the feature could be removed again in the future – let’s hope not, because it’s pretty handy. I can’t get this to work on my iPad 2 running iOS 9.3.5 – is this feature not included in this version? 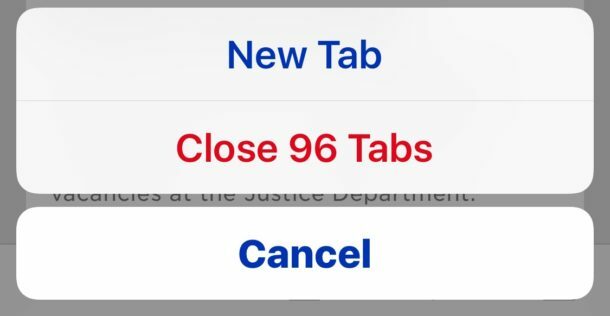 I can close tabs on my iPad and my iPhone as described, but I don’t like to close all the tabs and I would rather keep them open for future reference. Tabs are kind of the new Bookmarks, you know what I mean? Anyway, the ability to close all Safari tabs requires new iOS versions, anything like iOS 10 or later, or iOS 8 or earlier. Apple removed the ability to close tabs in iOS 9, because Apple. Work on my iPad in iOS 9. It just don’t look the same. Right at the top of all the tabs it says “close all tabs”. I can’t find any tip. This is not a comment about IOS, so please take it with a little humour. You write de ja vue, which means “already seen”, and is written “déja vue” Déja means already. Storm is right! Darn, nils, you screwed up the spelling nearly as badly as the author of the article did. Thank you, I just used this on my iPhone, I had 16 tabs open. « Need Some Holiday Gift Ideas? Our Gift Guide Can Help!